It is well-proven that employee wellness and employee performance are closely interrelated. A culture that puts wellness at high importance drives greater results by facilitating and creating an engaged workforce. Engaged employees not only outperform their peers in productivity and profit, but also in categories such as employee retention. 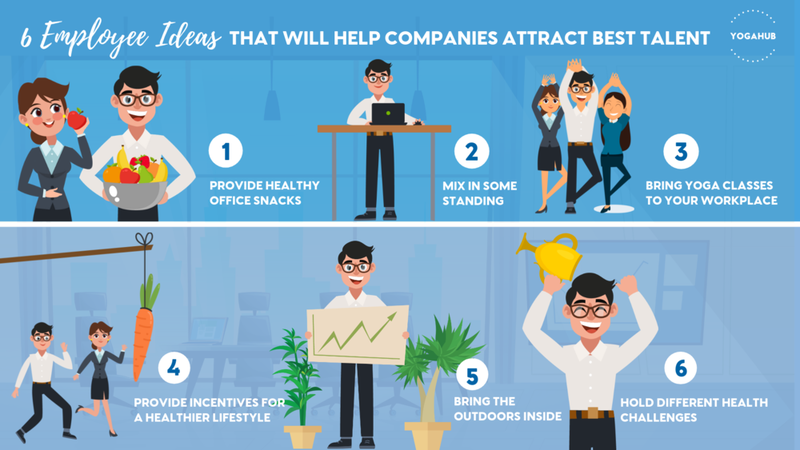 Here are 6 employee wellness ideas that any company can implement to get their staffs excited, make a positive impact on their well-being, and help improve performance. Most companies offer traditional vending machine snacks such as candy bars, chips or soda. Because they are full with sugar and saturated fat they are the main culprit of energy crashes and low productivity. Apart from that they also negatively contribute to employee health in the long run. It is important to go beyond sugary sweets and provide healthier snack options throughout the whole workday. The easier the access to healthy foods, the more likely your staff is going to improve their eating habits and overall well-being. 2. Standing is the new hit! Long hours of continuous sitting can lead to numerous health problems, from disc damage, strained neck to a swayed back in the long run. Reducing sedentary time can improve physical, metabolic and even mental health. Therefore, sitting less and standing more is such an important lifestyle change. Get your employees on their feet with standing desks and prevent a whole of health problems related to being deskbound. As standing also improves mood and boosts energy levels, using a standing desk can significantly improve overall productivity. Stress is the silent killer lurking in your office.Yoga represents the ultimate stress-relieve and meditation and other mindfulness techniques have been shown to help reduce anxiety and tension. Offer yoga classes or a guided meditation workshops directly at your workplace. It is cost friendly and proven to be one of the most effective ways to achieve happy and productive employees. Don’t hesitate and contact YogaHub for more information. Numerous studies have shown that elements of nature and access to greens have positive effect on productivity, helps relieve stress and even soothe mental illness. Bring a piece of the outdoors inside by making sure your office has plenty of potted plants. This can do real magic! Some people need a bit of a push to jump start a new lifestyle journey. Connecting healthy living to cash bonuses or other benefits is a gigantic incentive to start going to the gym more regularly,, or even stop smoking. By doing so your staff will see how strong your commitment to employee wellness is and will thank you with loyalty and devotion. Encourage healthy living at your company by holding monthly health challenges. Gamification is always a fun way to create new habits for long-term wellbeing. Who logs in the most steps next month? Which department can keep up with the 7 Hours of Sleep challenge? Don’t limit your ideas to only physical health and dieting. Mental health and financial health is equally as important to your employees to feel good about their live and themselves. These contests will allow your employees to steadily commit to a culture of wellness in a manner that is not overbearing or overwhelming while still having fun doing it.